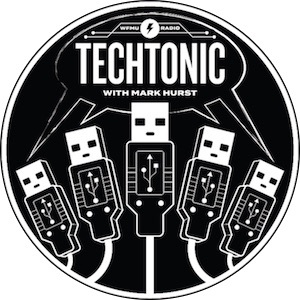 Techtonic is a weekly one-hour FM radio show on Jersey City-based WFMU, hosted by Mark Hurst. The show covers "our shift to a digital future." Listen live from 6pm-7pm Eastern every Monday: livestream at wfmu.org or at 91.1 FM and 91.9 FM in the NYC/NJ metro area. Archived shows are in the Techtonic podcast and in WFMU's web archive. • April 15, 2019: Clive Thompson on his new book "Coders: The Making of a New Tribe and the Remaking of the World." See show notes, listen to entire show, or jump to interview. • April 1, 2019: "Gridlock Sam" Schwartz on autonomous vehicles and his book "No One at the Wheel." See show notes, listen to entire show, or jump to interview. • March 25, 2019: Kevin Dugan, live in-studio, on "Earnin," a Silicon Valley-based app that definitely doesn't offer payday loans, and surely doesn't charge an interest rate! They call it "non-recourse transactions with optional tips" - that annualize to an APR of over 400%. See show notes, listen to entire show, or jump to interview. • March 18, 2019: Nis Frome, live in-studio, on losing weight and getting fit in the digital age. See show notes, listen to the whole show, or jump to interview. • March 4 and March 11, 2019: Fundraising shows for the 2019 marathon - the first cohosted by Pseu Braun, and the second by station manager Ken Freedman. (If you missed it, you can make a pledge here to get the 2019 Techtonic "angler fish" t-shirt, pictured on the show notes page. • Feb 25, 2019: Tim Harford, economist and author, on using behavioral economics to kick his smartphone addiction - whole show, or jump to interview. Here are show notes, including a link to Tim's essay about the process and his site, timharford.com. Also, Kevin Roose's essay on kicking his smartphone addiction mentioned past Techtonic guest Catherine Price. So we include a call from Catherine Price. • Feb 18, 2019: Maxim Pozdorovkin, director, "The Truth About Killer Robots," live in-studio - whole show, or jump to interview. Here are show notes, including a link to Maxim's movie. • Feb 11, 2019: Matt Novak, editor of Paleofuture, on past visions of the future - whole show, or jump to interview. Here are show notes. • Feb 4, 2019: Prof. Susan Crawford, author of "Fiber: The Coming Tech Revolution and Why American Might Miss It" - whole show, or jump to interview. Here are show notes. • Jan 28, 2019: Douglas Rushkoff, author of "Team Human" (and past WFMU host!) - whole show, or jump to interview. Here are show notes. • Jan 21, 2019: Prof. Safiya Noble, whole show, or jump to interview. Here are show notes. • Jan 14, 2019: David Lowery, of the bands Camper Van Beethoven and Cracker, on music in the digital age - whole show, or jump to interview. Here are show notes. • Jan 7, 2019: Station Manager Ken Freedman on tech in 2019, whole show, or jump to interview. Here are show notes. • Dec 31, 2018: Matt Haughey on getting scammed, and reviewing the Internet in 2018 - whole show, or jump to interview. Here are show notes. • Dec 24, 2018: Special holiday 2018 episode - whole show, or jump to Mark's reading of Jacques Ellul. Here are show notes. • Dec 17, 2018: Dava Whisenant, director of the outstanding documentary "Bathtubs Over Broadway" about corporate musicals of the 1950s and 60s - listen to the whole show, or jump to the interview, or straight to the brilliant song My Bathroom. Here are show notes, including a link to the movie site bathtubsoverbroadway.com. • Dec 10, 2018: Rex Sorgatz, author of "The Encyclopedia of Misinformation," live in-studio - whole show, or jump to interview. Here are show notes. • Dec 3, 2018: Letting go of the iPhone, a conversation with Mark's friend Brian - whole show, or jump to interview. Here are show notes. • Nov 26, 2018: Jonathan Tepper, author, "The Myth of Capitalism" - whole show, or jump to interview. Here are show notes. • Nov 19, 2018: Prof. Frank Pasquale, author of "The Black Box Society," on secret algorithms - whole show, or jump to interview. Here are show notes. • Nov 12, 2018: M.T. Anderson predicted the future in his novel "Feed" - whole show, or jump to interview. Here are show notes. • Nov 5, 2018: Journalist Ava Kofman on New York's LinkNYC kiosks - whole show, or jump to interview. Here are show notes, including her article on LinkNYC kiosks in the Intercept. ...see earlier Techtonic episodes in the WFMU archives. Just two minutes (or so) each! 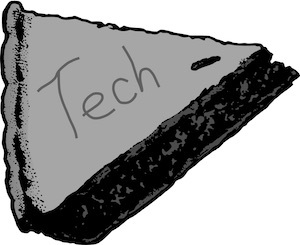 A Little Slice of Tech Pie is Mark Hurst's weekly segment on Wake & Bake, WFMU's weekday morning show hosted by Clay Pigeon. Hear it every Monday morning at 7:35am Eastern. • Apr 15, 2019 Tech Pie: Why Uber and Lyft don't pay benefits to their drivers. • Apr 8, 2019 Tech Pie: Hidden cameras in AirBnBs, Korean hotels, and now in hospital operating rooms. • Apr 1, 2019 Tech Pie: Driving with Waze? Google might try to manipulate the directions. • Mar 25, 2019 Tech Pie: From addiction to sugary foods to... addiction to a fitness app? • Mar 18, 2019 Tech Pie: Replacing Facebook with positive, real-world activities (feat. Tim Harford). • Feb 25, 2019 Tech Pie: Playing dumb: Facebook, Amazon, and Google act surprised when their creepy plans come to light. • Feb 18, 2019 Tech Pie: Amazon Nest surveillance device gets hacked. • Feb 4, 2019 Tech Pie: Facebook encourages "friendly fraud". • Jan 28, 2019 Tech Pie: DNA testing services aren't as accurate as you might think. • Jan 21, 2019 Tech Pie: AirBNB hosts and secret cameras. • Jan 14, 2019 Tech Pie: Amazon Ring cameras and what "smart" gadgets really do. • Jan 7, 2019 Tech Pie: Facebook and mind control via the WAND. • Dec 31, 2018 Tech Pie: Why you have to click all the stoplights and storefronts to "prove you're not a robot". • Dec 24, 2018 Tech Pie: Holiday anti-gift guide. • Dec 10, 2018 Tech Pie: Amazon's deceptive baby registry. • Dec 3, 2018 Tech Pie: How Silicon Valley ruined thermometers. • Nov 19, 2018 Tech Pie: Amazon HQ2 demands billions of dollars from New Yorkers. • Nov 12, 2018 Tech Pie: LinkNYC kiosks in New York have hidden cameras... and a hidden owner. • Kevin Dugan, New York Post reporter, Feb 23, 2019: "MARK HURST IS THE BEST. His show on WFMU - the world's greatest radio station - is the only one I'm aware of engaging in real conversations about the problems with technology, the interests of Silicon Valley, and how it's affecting us all. He's been doing this for YEARS. follow him." • Douglas Rushkoff, author and host of Team Human, Feb 1, 2019: "Tech humanist Mark Hurst interviewed me for his Techtonic podcast and radio show. He was one of the first to argue for a more appropriate engagement with our tech."